Installation and HANDLING: 10 mn chrono ! this INVOICE, will allow you, in a few seconds, to set up a CLIENT file, to enter YOUR first sales items, and to INVOICE instantly ! ASSISTANCE ,G R A T U I T E ! Contact Center is a versatile software that acts as a CRM, collaborative solution and multi-channel communication platform. It gathers within the same application all the functions necessary to manage all your contacts. CRM-Easy helps to attract more customers, retain the best customers and increase revenue per customer. Cirta Express a low-cost solution. This new version offers advanced and total control to ensure the success of your business. It is designed for service providers, craftsmen and self-employed entrepreneurs. Kafeo CRM is a customer relationship management software. It allows you to manage all your contacts as well as your commercial relationships. 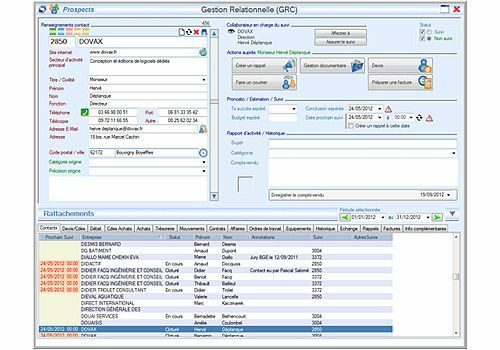 A complete tool, it gives you in real time the status of your relations with all your contacts. ScrapWorkshop is an integrated tool for activity management and monitoring for creative leisure leaders. VDLysCRM is a server software, allowing you to use your CRM from the internet browser of your computers or smartphones.